Kiss Me, Kate is a musical with music and lyrics by Cole Porter. The story involves the production of a musical version of William Shakespeare’s The Taming of the Shrew and the conflict on and off-stage between Fred Graham, the show’s director, producer, and star, and his leading lady, his ex-wife Lilli Vanessi. A secondary romance concerns Lois Lane, the actress playing Bianca, and her gambler boyfriend, Bill, who runs afoul with some gangsters. The original production starred Alfred Drake, Patricia Morison, Lisa Kirk and Harold Lang and won the Tony-Award. 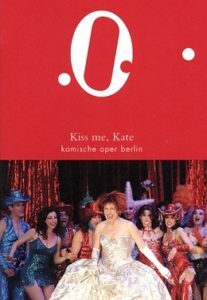 Kiss Me, Kate was Porter’s response to Rodgers and Hammerstein’s Oklahoma! and other integrated musicals; it was the first show he wrote in which the music and lyrics were firmly connected to the script, and it proved to be his biggest hit and the only one of his shows to run for more than 1,000 performances on Broadway. In 1949, it won the first Tony Award presented for Best Musical.